"My name is Jason Dermott. I'm a private investigator and ex-pat living and working in Hong Kong. In a modern context, Janus, the Roman god wearing two faces, symbolizes someone who is two-faced. My clients are often a stand-in for Janus. I can usually tell right away. Sometimes I can’t, and that’s when I run into trouble. It was almost too late in my search for William Steiner before I realized my client was a Janus. But but then Sondra Wilkerson wasn’t the only one-eyed face card in the marked deck I was playing with." 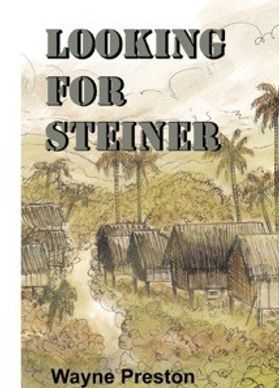 In the tradition of Nelson DeMille and William Patterson, Steiner is a fast-paced, international mystery with layers of interconnected plots. Jason Dermott is a private investigator and an expatriate living and working in Hong Kong. His specialty is finding missing people in cases where government and police agencies have ultimately given up investigating. His police and military background along with his fluency in Mandarin Chinese is the reason Sondra Wilkerson has come to Hong Kong in hopes Dermott can find her missing half-brother, Sergeant William Steiner. Dermott is not hopeful for Steiner disappeared while on patrol in the Central Highlands of Vietnam nearly forty years before. Against his better judgment, Dermott takes on the case. Dermott identifies four men, three former U.S. soldiers and the patrol’s native guide, who are the last known survivors of the patrol who may know something about Steiner’s disappearance. He tracks down the three soldiers but each one is murdered soon after he interviews them with the police considering him a ‘person of interest’ in their deaths. Convinced by now Steiner is still alive and at risk in becoming a fourth victim, he goes to the Central Highlands to interview the native who guided the patrol. Before he solves the mystery surrounding the disappearance of William Steiner, Durmott will travel to three continents, become incarcerated in a Saigon jail, and evade a Vietnamese army patrol in the jungle only to risk becoming the fourth victim.